ELAC might not be a household name in every single part of the planet, but this manufacturer really knows how to make awesome bookshelf speakers. And ELAC Debut 2.0 B6.2 are a proof of that! The company was founded in 1920s and over the course of its 90+ years of existence, ELAC ventured in a variety of businesses. Sonars and sewing machines are just some of the products ELAC made in the past. But then in the mid-1980s, ELAC realized that making loudspeakers was something they do the best. Rewind three decades and ELAC have created one of the best bookshelf speaker sets the world has ever seen. We’re talking about ELAC Debut 2.0 B6.2, speakers that have won a number of awards from industry experts. The reason is pretty obvious – these bookshelf speakers leave the competitors behind with their brilliant audio performances. 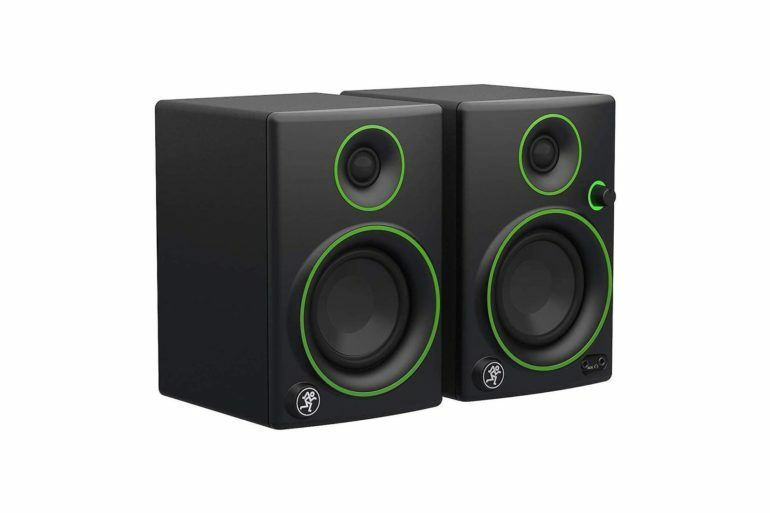 ELAC Debut 2.0 B6.2 is an upgraded version of a speaker that was released back in 2015. The original bookshelf speaker, the B6, is also the brainchild of Andrew Jones who previously worked as a designer at Pioneer. As soon as ELAC Debut B6 was released, it was met with praise, both from users and industry professionals. Users loved it for its price-quality ratio, while professionals regarded it as a set of bookshelf speakers with truly fantastic audio performances. And even though everyone was praising the original model for the quality of sound it makes, ELAC wanted to take it one step further. They wanted Andrew Jones to give his utmost and design an even better set of bookshelf speakers. And that’s how ELAC Debut 2.0 B6.2 came to existence. You would think that a new version of ELAC Debut B6 would look like its predecessor, but that just isn’t the case. Although Andrew Jones remained faithful to the retro style of the speakers, the upgraded version differs a lot from the 2015 model. First of all, you will notice that ELAC Debut 2.0 B6.2 speakers come with a bass port on the front. The new speakers are also much taller and slimmer than the old ones. Many reviewers, us included, think that the improvements make ELAC Debut 2.0 B6.2 a much more elegant set of speakers than the previous version. 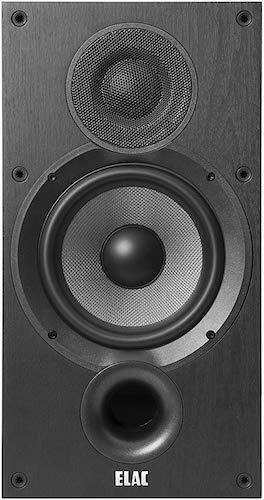 Speaking of dimensions, ELAC Debut 2.0 B6.2 are 14.76-inches high, 7.69-inches wide, while their depth is 10.55 inches. Same as the original version, the B6.2 use a 6.5-inch woofer, which is made of aramid fiber, a type of material that’s very similar to Kevlar. B6.2 also have a 1-inch silk dome tweeter covered in black mesh wrap. Another addition is the use of extra bracing meant to deal with potential sonic coloration. 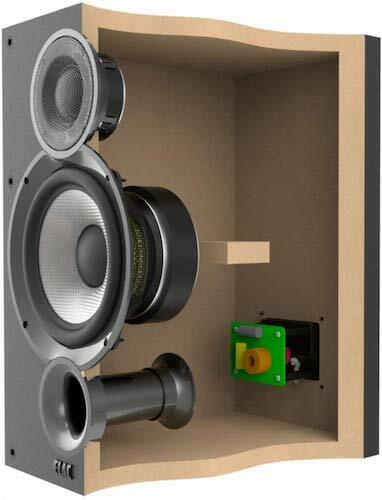 There’s also an extruded dust cap, the purpose of which is to make the speakers more responsive. 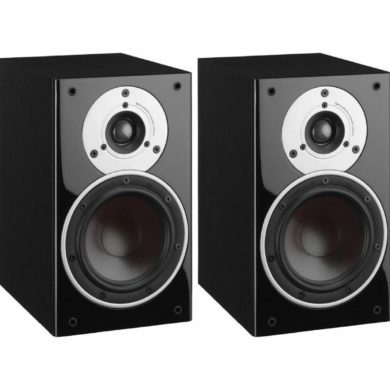 Frequency response: 44-35,000 Hz – These bookshelf speakers can reproduce audio in a really wide frequency range, which basically means that they can play any sound that the human ear can hear. And they can do it without any distortions, something that makes the two ELAC Debut 2.0 B6.2 speakers the only speakers you’ll need. Silk-dome tweeter – The 1-inch silk-dome tweeter utilizes the wide-roll surround technology, but the thing that really makes it stand out is that it can handle frequencies as high as 30 kHz. Furthermore, thanks to the fact that there’s a waveguide, you got nothing to worry about dispersion; it’s taken care of! Aramid fiber woofer – The 6.5-inch woofer features a cone that’s made of aramid fiber. In turn, this makes it better than paper or polypropylene domes when it comes to damping and stiffness. And because it’s stronger, it can do much better when playing bass. Speaking of bass, the woofer can go as low as 44 Hz. Frontal bass port – Because the bass port is placed upfront, you will be able to place the speakers against the wall, meaning that you shouldn’t struggle to find a place for them in your living room, office, or whatever. 3-year warranty – If you’re worried that the bookshelf speakers will stop working well after a while, we assure you they won’t. And even if they do, ELAC will deal with the problem by either fixing or replacing them. Of course, only if the problem has occurred during the warranty period, that is, in the period of three years since the purchase. Distortion-free audio – The number one reason why ELAC Debut 2.0 B6.2 have won numerous accolades from the industry professionals is the fact that they’re great at audio reproduction. The sound they make is clear across a wide spectrum of frequencies. These speakers can play audio as high as 33,000 Hz without any distortions. Amazing bass – Apart from being truly awesome when it comes to playing mids and highs, ELAC Debut 2.0 B6.2 are also great for playing bone-shaking bass. The sound is super-deep and super-powerful, something you wouldn’t expect even from some much larger speakers. 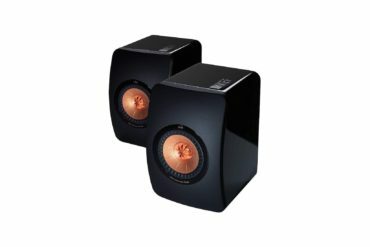 We’re sure that these pretty-compact speakers are going to pleasantly surprise you with their low-frequency performances. Elegant design – Bookshelf speakers need to look nice; otherwise, you won’t feel proud keeping them in your living room. And ELAC Debut 2.0 B6.2 speakers really look beautiful. Their retro design looks classy and does not stand out. This makes them suitable for literally any room, regardless of its design. Quality & durability – ELAC made these speakers to last for a long time. You can be sure their audio performances won’t drop after a while. ELAC Debut 2.0 B6.2 are meant to work fine for many, many years. Of course, if something goes wrong with these speakers, you will be able to fix it for free, if the problem has occurred during the 3-year warranty period. 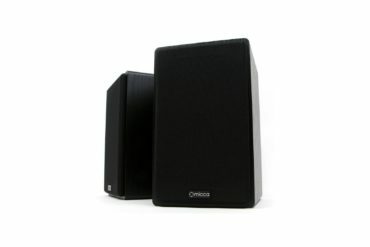 Reasonable price – Considering how awesome these speakers are in terms of audio performances, as well as looks and durability, it’s really strange that they don’t cost much more. Of course, they’re not budget bookshelf speakers, but no one can say that they’re expensive. No wall-mount hardware – If you plan the keep them on the bookshelf, all’s fine. But, if you want to have them mounted on the wall, you will have to do a little bit of work. And you will have to pay a little extra for the mount hardware. If, for some reason, you do not want to get the ELAC Debut 2.0 B6.2, there are a couple of alternatives you should take a look at. The most obvious choice is the original version of the speakers, the B6 model. Released in 2015, the speakers might not be as awesome in terms of audio performances as the upgraded version, but in all honesty, you probably won’t even notice the difference. Actually, the biggest difference between the two is that the older version is slightly shorter and wider. And if you’re not a fan of this manufacturer, but you would still like to get a pair of high-end bookshelf speakers that do not cost too much, there are a few other products that might interest you. The Edifier R1280T, for example, seem to fit the description. These are wireless bookshelf speakers which are fantastic in terms of audio performances. 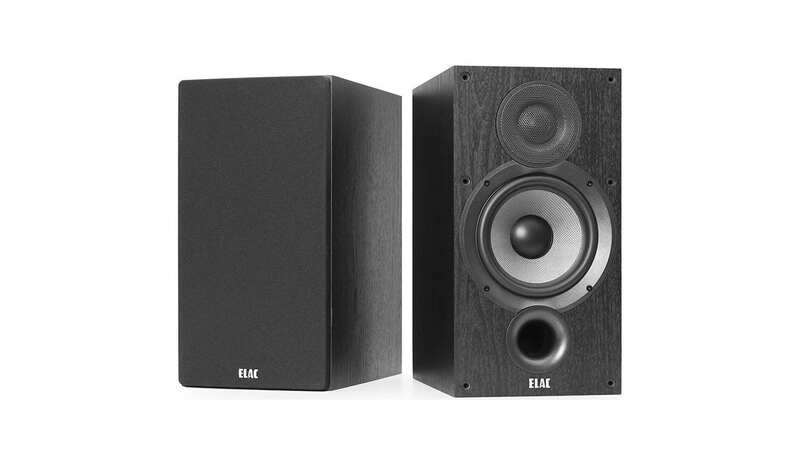 Unfortunately, their price is about two times higher than the price of ELAC Debut 2.0 B6.2. 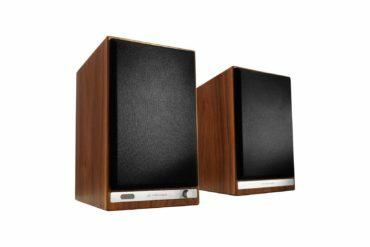 If you want something cheaper, even cheaper than ELAC Debut 2.0 B6.2, our advice is to take a look at what Polk Audio has to offer. This manufacturer is famous for making affordable bookshelf speakers that make pretty awesome sound. If you don’t wanna waste time searching for the best model, our advice is to focus on Polk Audio TSi200, a set of speakers that can be found for even less than two hundred bucks. ELAC Debut 2.0 B6.2 didn’t get all those awards by accident. These bookshelf speakers are really worthy of the accolades. Even the pickiest audiophiles are satisfied with the quality of sound these speakers make. And this goes for literally all the frequencies that the human ear can hear. Mids are simply brilliant, high are distortion-free, and bass is surprising deep and powerful. If you’re still not convinced that ELAC Debut 2.0 B6.2 are the right bookshelf speakers for you, there’s another thing you should know. They’re built to last for a long time. ELAC used top-quality materials for these speakers, ensuring that they will keep on providing you with amazing audio performances years after you’ve bought them. 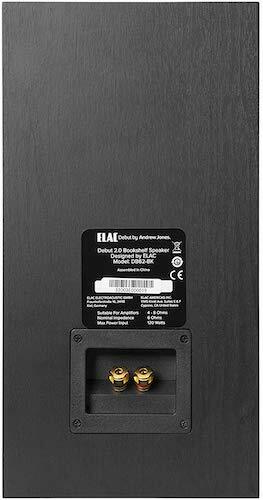 In fact, the manufacturer is so certain of this that ELAC is giving a 3-year warranty on these speakers. ELAC Debut 2.0 B6.2 also look very nice and are guaranteed to fit in well in your living room, office, or wherever you decide to put them. The final reason why we’re so impressed with these speakers is that they do not cost much. Considering how amazing they are, their price is actually pretty low.